Apprentis d’Auteuil is a Catholic public interest foundation. We have been working to help young people in difficulty for 150 years in France and 20 years internationally. Our goal is to provide access to quality education and training which allows young people to more fully integrate society as free and responsible adults. Currently, in the world, 61 million children do not go to school. Among them, 26% are school dropouts. Worldwide, lack of education is one of the major causes and one of the consequences arising from the marginalization of children. If Africa remains by far the continent with the largest amount of children which do not attend school, no continent is spared. This reality equally affects Western countries. Indeed, in France, approximately 140,000 youth quit the school system each year without a diploma or training. At Apprentis d’Auteuil we act as a direct operator in France along with our international partners, we put in place measures committed to education, access to schooling and the fight against school withdrawal. Adapted to local problems and to the requirements of young people in their care, our actions give the chance to thousands of young people to go back to or discover school and integrate socially. France: Educational support and course selection structure for those that have left the school system. Apprentis d’Auteuil have created an educational and study support structure, a unit specializing in welcoming students between the ages of 13 to 16 who have dropped out of school. This structure welcomes 70 young people per year, the unit is situated within a general secondary and professional school. The goal is to let young people develop alongside other adolescents and avoid them feeling cut off from others which in turn helps them socialize again. The goal is to get young people back into the school system offering them apprenticeships that make sense to them. We also consider that increasing their general culture is an essential element in the learning process. With the support of a team of teachers and a team of educators, these young people regain confidence: 95% of them persevere with their education. For 6 years, Apprentis d’Auteuil has helped Tahaddi to develop medical and educational centres for the most disadvantaged populations in the south Beirut suburb. 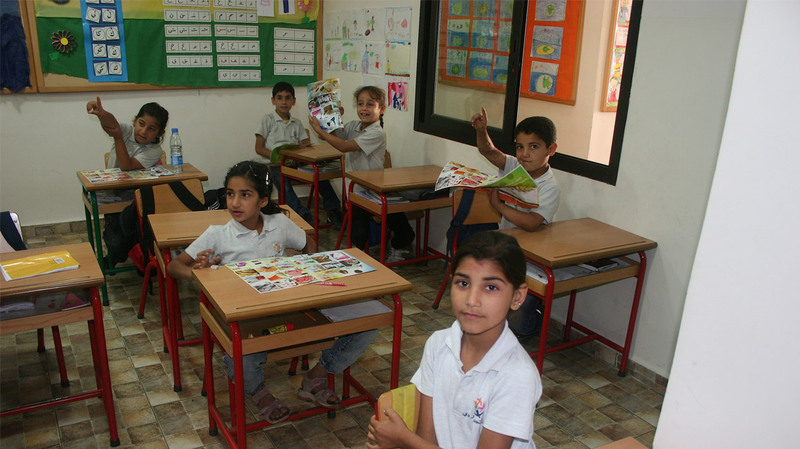 Since 1996, one of the tasks of the Tahaddi educational centre (CET) has been to develop learning and integration capacities of children excluded from society for economic or social reasons. The CET offers a home for children from the neighbourhood who are not receiving any education, providing formal education adapted to their needs, school support and literacy activities for children and adults from the neighbourhood, psycho-educational activities and a social service for vocational guidance, training and monitoring of children at the centre. Since 2012, the Syrian crisis has led to major programme development: the Syrian-born population receiving services from Tahaddi now represents over 50% of the beneficiaries. The NGO ensures that help and services are equally shared among communities to preserve a balance and keep the peace between them. Since 2002, Apprentis d'Auteuil has been supporting LUOVI actions in Finland and has been working closely with the organisation, both on skills exchanges and school exchanges. LUOVI homes and trains nearly 2,000 young people with serious learning difficulties often connected to disability, in areas such as audio-visual communication, graphic arts, horticulture, agriculture, woodwork, cooking and catering. Methods used by Luovi favour the "learning by doing" approach, the development of power to act and business role-playing, ensuring all the young people they support are supplied with the skills they need in the future. Promoting good self-esteem is central to their support, to ensure a stable future is built. Luovi takes an interesting stance on young people, based on accountability. Several activities are therefore offered to help them become self-sufficient in their personal and professional lives. The youngsters know that their own investment in defining and implementing their integration into the world of work is paramount. Almost 2,000 young people guided by Apprentis d’Auteuil and our international partners benefit from these exchanges in Europe and the rest of the world. European projects revolve around educational and language study holidays and professional training. Solidarity sites take on young apprentices together with other young people and take them to the other side of the world working on renovation or construction projects or even cultural or artistic projects. In the summer of 2013, eight young people from Apprentis d’Auteuil children’s homes made a trip to Benin. For three weeks, they worked with youngsters from Benin to build a poultry farm. This farm enables young girls from the Sainte-Bibiane shelter in Porto-Novo to develop a small subsistence business. Continuing this cultural exchange, young French people from the Ange Gardien and Sant- Jordi institutions welcomed youngsters from Benin from the first projects for a new project in Quillan, France. Together, they built the outside of the Ange Gardien children’s home, thereby consolidating lasting links and enriching exchanges between France and Benin. In addition to the challenges of safeguarding and protecting young people, championed by the support organisation and by Apprentis d’Auteuil for schooling and training disadvantaged children, we can now add an interest in cultural exchange.